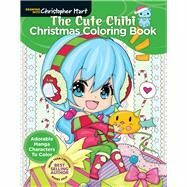 Have yourself a merry Chibi Christmas with this totally adorable coloring book from bestselling author Chris Hart! Just in time to go under the tree, The Cute Chibi Christmas Coloring Book gives manga maniacs and coloring fanatics an additional reason to celebrate! Chibis are the cutest characters in manga, and these 47 holiday-themed illustrations are ideal for Christmas coloring. Imagine a little chibi Santa or reindeer, an adorable chibi kitten peeking out of a stocking, or a rosy-cheeked chibi ice skater out in the falling snow. Intricate backgrounds accompany each character to make for a fun and challenging coloring experience, and all pages are printed single sided on quality stock to allow for the use of most coloring materials. With over seven million copies of his books in print, Christopher Hart is the world’s leading author of art instruction books. His books have been translated into more than 20 languages. In his more than 50 titles, he offers artists accessible, generously illustrated, and clearly written step-by-step instruction on a wide variety of how-to-draw subjects. He lives in Westport, CT.